I like Jodie Foster, but this movie, Flight Plan, was too far-fetched for my liking. I did watch it till the end, and there was plenty of twists, but you need serious suspension of disbelief to enjoy this movie. It's not often I come across a book that, from the first page, I know I'm going to love. David Maine's The Flood is one of those books. Now, don't be put out by the picture of David Maine in his blog - he looks a bit mad, but he writes a good yarn - that's all that matters as far as I'm concerned. The Flood is about ... the Flood, who would have guessed. I'm not into biblical stories, but this is the story of Noah and his family, so it's a very human story, and God, while omnipresent, and definitely omnipotent, isn't too intrusive an influence in this book (if you set aside the fact that he is the cause of it all, and that he talks to Noe whenever the fancy takes him.). ...Noe finishes the stew, sets the bowl aside, clears his throat. The wife recognizes this as a signal of forthcoming speech and offers her attention. Noe says, I must build a boat." Lovely day today. Sunshine and a nice strong breeze, but not cold. We went for a walk in Bray - the seafront was full of people who, like us, wanted to enjoy the lovely fresh air. This is probably my favourite time of the year - the days are getting longer (it's still bright at 5), the buds are coming out and the birds are singing like mad in the mornings. Plenty of cold wet days ahead still, but on a day like today, you can be fooled into thinking that spring is just around the corner. For every Syriana, there is a 300! I really don't know why I kept on watching 300 - it was formulaic, un-inspiring, pretentious and if the actors had been any more wooden, they would have been called Pinocchio. All battle scenes were shown in slow motion - Slow motion is fine in small doses, but if you use it too much, you lose the impact - I felt like I was watching a cartoon, and, I don't know about you, but I don't care if cartoon characters live or die. So, the fate of King Leonidas and his men didn't matter to me one bit. And I found it quite irritating that all Persian men had to be black - maybe it was designed so that an 8-year old could differentiate between the goodies and the baddies, but surely, that can't be historically correct! I don't know much about that part of Greek history, but I know that Persia is Iran, and last I heard, not in Africa! Ok, now I've just watched a bit of the website, and I get it - it's based on a graphic novel, and that's why every scene is completely stylised! Mmm. I still don't like it - Like all Belgians, I like a good graphic novel, but I don't think it adapts well to the film medium. I would have prefered an animated movie instead. What a fitting end for my Onion! I'm cooking it right now, in a Pumpkin Coconut Bisque recipe from Aine McAteer's book Recipes to Nurture, my favourite (and only?) cookbook! I think it's great when fruit and vegetables fulfill their destiny! Syriana, Good Night, and Good Luck. A few good movies on the telly, lately. In the last week, we've watched George Clooney in 2 movies: Syriana, and Good Night, and Good Luck. Véronique had warned me that Syriana wasn't an easy movie to follow - watching it on a small screen didn't help - a lot of the sub-titles were too small and too white over the glare of the desert's sand. There are still some strands I'm not completely sure about, even after reading the synopsis on the website. But what a great movie, particularly in this day and age. I won't spoil it for you - there is some satisfaction in slowly understanding what's going on! Be warned, though, it's a violent movie - I couldn't watch the torture scene at all! In some ways, Good Night, and Good Luck is a much gentler movie - a great one if you're interested in the McCarthy era in the 50s, and it's got a great soundtrack too. But in other ways, it asks questions that are just as important, about democracy, about the rights of the individual, and about the corruption of a State that puts those rights to the side in order to pursue its goals. Both very interesting movies about integrity, the men who fight for the truth, and those who believe only in their own self-interest and money. Fair play to Clooney for taking on such projects that challenge the viewers and force us to question the world we live in. Happy Birthday, Françoise - See, I thought of it on the day! I haven't sent you a card yet, though! I don't think I've ever completed a watercolour project so quickly. I embarked on this one only about 3 weeks ago at most. I know for sure it was after 1 January, anyway. 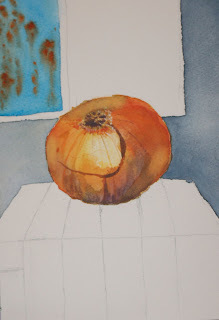 Desppite being very busy, I managed to fit in the time to do this little watercolour that I'm very proud of - The Onion. 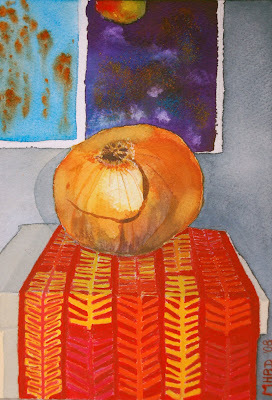 Or will I call it "Onion on Aveda gift box"? I guess the difference with previous projects is that I dived straight in - no preliminary experiments with Adobe Photoshop or the Wacom tablet (my Mac is misbehaving again, so I haven't really used it much - everything is gone really really slow again), no aboriginal snails to try out the colours. 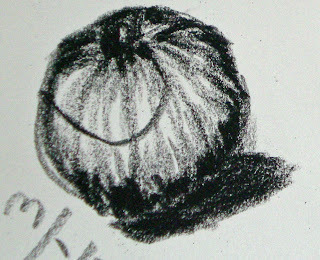 I only did a few drawings as a starting point, and took a couple of pictures, in case the onion went bad (which it didn't - we've probably eaten it now!). Actually, the photograph is at a slightly different angle than what I painted, as I was sitting slightly higher when I was painting, whereas the photograph is taken from slightly below. The only item for which I experimented on a separate piece of paper was the chevron pattern on the Aveda gift box (a gift from a few Christmases ago. I have a lovely big Lush gift box from this Christmas that I must use next time!). I was worried I would ruin the whole thing by messing that up, so I wanted to try out my watercolour pencils to draw the pattern, then apply water to fix it in. It worked nicely. A bit laborious, but the right side of my brain didn't mind at all! Comme je n'ai pas encore envoyé de carte, je te souhaite un très bon anniversaire, avec quelques jours d'avance! 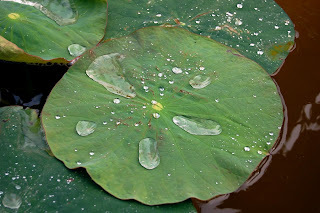 Ce nénuphar provient de l'abbaye de Fontfroide! Today, I added the 2nd painting in the background (but it is ... 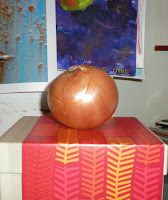 Floating Apple, of course), I put in the onion's shadow (I'll need to make that darker), and I started working on the box. At this stage, I think I can bring the onion back to the kitchen. All I need is the box. Still not sure how I'm going to paint the pattern. The more I look at it, the simpler it looks, but maybe I should try it out on a separate piece of paper first. I do tend to be slightly obsessive when it comes to my watercolour projects - I spent weeks working on my "Aboriginal Snail" Christmas card series, and I took a picture of every single one of them before sending them! I could never be a commercial artist! 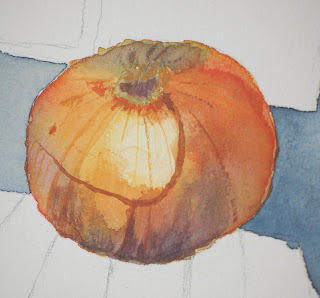 I've started work on an Onion watercolour, based on the Onion drawings I did after Christmas. 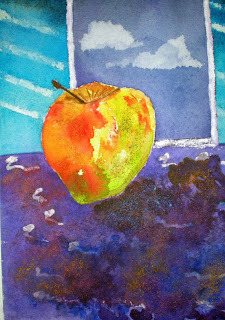 I was quite pleased with my Floating Apple still life, so I decided to try out a few other fruit and veg! It's taken me a few layers to get the tones right. I think I will leave it alone, for fear of muddying it, and I'm going to concentrate on the background and foreground elements for now. Here is an enlarged picture of it at an earlier stage. I'm leaving the box on which the onion is standing till the end. It's an old Aveda gift box, and there is quite a bit of detail on it, which I'm not sure how to tackle yet. Wish me luck! Avec quelques jours de retard, mais on était là pour le jour même, c'est ce qui compte! J'espère que ce fut une bonne surprise. Je me dis que tu devais bien t'en douter, en dépis de nos efforts pour garder l'effet de surprise! 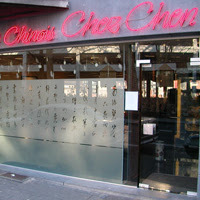 Nous nous sommes levés à 4 heures du matin, pour arriver au restaurant (Chez Chen, rue Borgnet) à midi! Un véritable "Planes, Trains and Automobiles", mais tout c'est bien goupillé, à part un petit retard de l'avion, car il avait gelé et ils ont dû faire dégivrer les ailes avant le décolage. Repas délicieux - le menu à €23.50 était parfait - un grand choix de plats principaux, chacun ayant un goût bien distinct. Et nous avions commandé un gateau aux fruits de chez Dumont, un vrai délice! Joyeux Anniversaire, de la part d'André, Marie-Hélène, Yves, Brendan, Ingrid, Erika, Laura et Sander! Gros bisous et Joyeux Anniversaire! J'espère que tu aimes bien le cadeau de Mamy et Papy! One technique I'm playing with at the moment is the "modelled drawing". Nothing to do with fashion, but "modelling" as in modelling clay. This is something I've read about in Nicolaides' The natural Way to Draw, one of the bibles of drawing, a present from Brendan a couple of years ago. I'm making very slow progress with it (I'm on page 36 of 221), but it's an excellent book to understand shape, form, gesture, movement, volume and weight. Nicolaides doesn't focus on drawing the exact lines, but rather on "feeling" the object, much as if you were sculpting it rather than drawing. I find it tough going, but I go back to it every so often, and I find things that make a lot of sense, like instructions such as this: "Press hard where the form goes back - press more lightly where it comes towards you". This is a way to "touch and feel" the subject rather than trying to draw the lines and shadows. In these drawings I've tried various techniques, starting with lines and shadows, and finally venturing to modelled drawing. I like the apple in the top right the best. 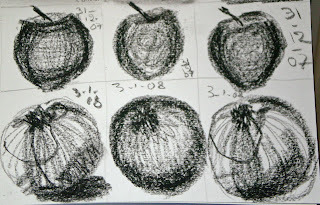 Here are the drawings I did of the apple before starting my watercolour work. I know it looks like it's sitting on top of a dozen pancakes, but that was actually a special effect caused by the lights above the table where I was sitting! Happy Birthday, All, with a cropped version of the Floating Apple! If, like me, you're curious as to how Japanese woodblock prints were made, have a look at this animation from the Fitzwilliam museum! Here are a couple of pictures of the Floating Apple at different stages of completion. I'm very happy with the overall result for this piece. 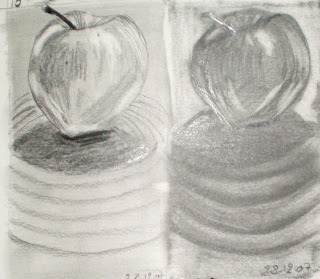 I did a drawing of the apple first in my sketchbook, and then did a light drawing on the watercolour paper. 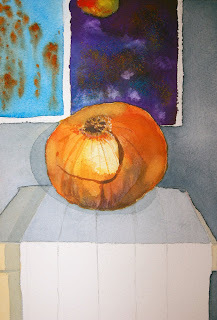 I was inspired by Shirley Trevena's book Taking Risks with Watercolours, which Brendan gave me last Christmas. 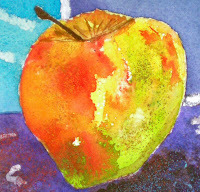 She has a very free way to handle watercolours, and I've been playing with some of the techniques she recommends, but this is the first time I feel I applied them fully to a painting so I'm very pleased with the result, despite the fact that the apple isn't quite anchored on the table! Avec 2 jours de retard. Je suis vraiment désolée de ce retard. Pour me faire pardonner, voici une photo de mon tout dernier projet d'aquarelles: "Floating Apple" ou "Pomme sur Tapis Volant"